Bryde’s whales (Balaenopetra brydei) are resident in South African coastal waters and can be seen in Plettenberg Bay all year round. Bryde’s whales are divided into two forms, inshore and offshore, and studies have shown that these are genetically separate subspecies. They were first described off South Africa by Ørjan Olsen, a Norwegian whaler in 1912. 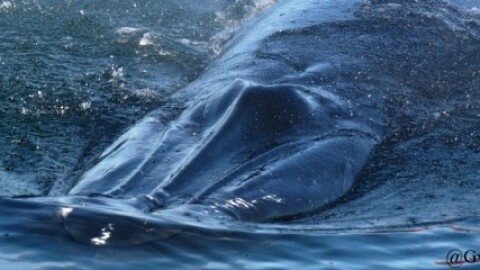 He gave them the name Bryde’s whale after the Norwegian consul to South Africa at the time, Mr Johan Bryde. Bryde’s whales are dark grey dorsally with a paler grey- white underside (countershading) They have a small, sickle-shaped dorsal fin that is situated 2/3rds of the way down the body. Their most distinguishing feature is the 3 parallel ridges running along the top jaw (see photo). They reach lengths of 13 – 14 m and weigh around 20 tons. Globally Bryde’s whales can be found in most tropical and warm-temperate waters. Off South Africa, the inshore form has a restricted distribution that extends approximately from East London on the east coast to Saldanha Bay on the west coast. They are generally solitary animals (except cows and calves), but large aggregations of 10 – 20 individuals can form during feeding. They feed mostly on small pelagic shoaling fish such as sardine, anchovy and maasbanker and unlike most other whale species, they feed throughout the year. They are not deep divers and when travelling their surfacing behaviour is usually 1 – 6 short dives of about 1 minute, but if necessary they can hold their breath for up to 20 minutes. With their fast travelling and solitary life they got the nickname “now-you-see-me-now-you-don’t”. The international conservation status for Bryde’s whales is ‘data deficient’. This is due to the uncertainty of how many species, sub-species and populations there are around the world and also a lack of data on abundance, survival rates and behaviour. – Kato, H. (2002). Bryde’s Whales, Balaenoptera edeni and B.brydei. In Encyclopedia of Marine Mammals (eds W.F. Perrin, B. Wursig & J.G.M. Thewissen), pp. 171-176. – Best, PB (2007) Whales and Dolphins of the southern African Subregion. Cambridge University Press. Southern right whale conservationWhat did our guests think?